Yes, this is also called a Latkes but really I first heard them called potato pancake so I’ll go with that. A tasty brunch item or even a dinner side dish. These are great on their own with a bit of fat free sour cream and sautéed onions, or topped with light cream cheese and salmon. Num! No limits with these really. I’ve even seen them eaten with honey. Sweet and savoury. My grandmother would often make something similar to these for breakfast. 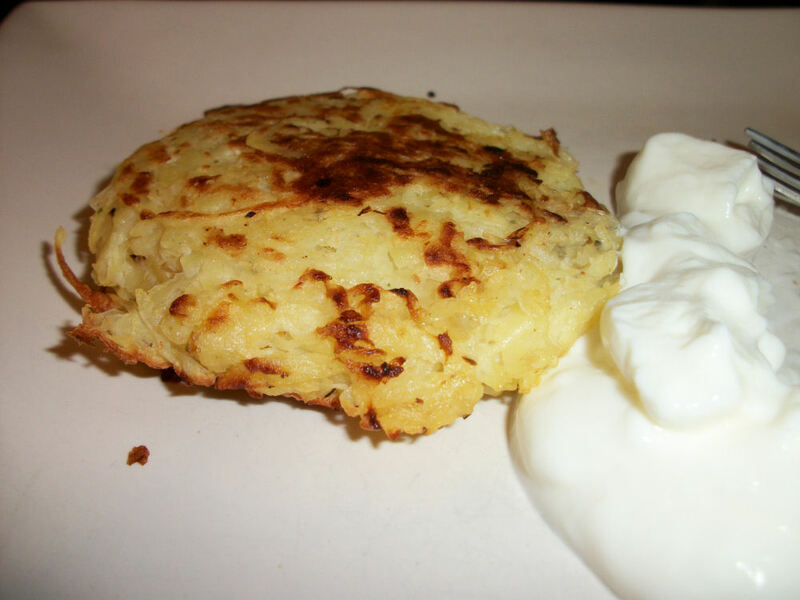 Want to add a bit more flavour to your potato pancake? Try subbing in a bit of shredded carrot or celery root instead of half of the potato. It’s great and more veggy nutritious goodness! These particular pancakes were made by my husband for a special weekend breakfast under some advisement from me. Goodtimes. Grate potatoes and onion using the coarse side of the grater. Stir to combine. Using a colander, squeeze the mixture to get the excess liquid out. Move the mixture to a bowl. Add the flour, egg whites and seasoning. Spray a pan with non-stick. Heat to medium, when hot enough drop 1/4 cup of batter into piles on the pan. Leave plenty of room between the piles. Press the piles to form a flat pancake. Allow to brown on the bottom, about 3 minutes, flip carefully and allow other side to brown. Serve. Makes plenty to serve 2 people. Each serving (half of the resulting pancakes) is 123 calories, .4 grams of fat and 3.1 grams of fibre. This entry was posted in Breakfast, Dinner, Sidedish and tagged Egg, Onion, Potato. Bookmark the permalink. I looked at this recipe before I went to bed via your twitter post, and then dreamed of potato pancakes. Mike makes them from time to time and I can’t get enough! I eat them plain but can see where sour cream would be pretty good with them. Mmm what an awesome dream to have! I hope you have informed Mike that he will have to make you more potato pancakes in the near future. Oh yum! I love potato pancakes! What do you think about making them with sweet potatoes or yams? Sweet potato cakes are delicious! I highly recommend adding some chopped up pecans and cinnamon to the mix. The crunch and protein they provide are just too nummy to miss! Skip the onions unless you want a sweet and savory mix, which is great for a fancy brunch.